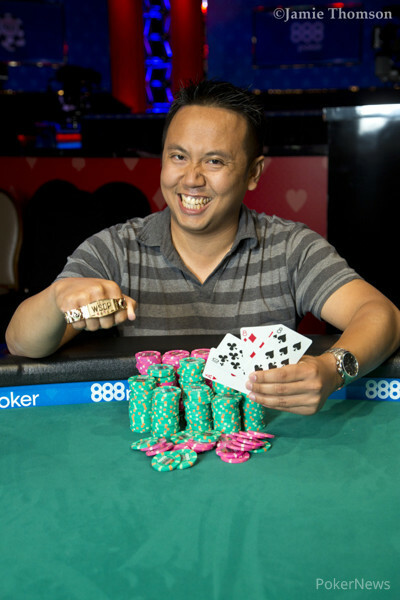 Smith Sirisakorn emerged victorious in the $2,500 Omaha Hi-Lo 8 or Better/Seven Card Stud Hi-Lo 8 or Better Mix, beating a 405-player field to scoop his first WSOP bracelet and a juicy $215,902 top prize. "I'm in a shock," Sirisakorn said in the moments of victory. "I'm still kinda dazed," he added. Coming into the tournament, Sirisakorn had no reported live cashes to his name. "I have only one cash from a tournament, from many years ago," he revealed. Sirisakorn mostly plays cash games in Los Angeles. He's at home in $40/$80 limits, and Omaha/8 and Stud/8 are his main disciplines. "I'm not playing many tournaments," he said. While he has a ton of experience from cash games, Sirisakorn is a recreational player who operates a franchise of restaurants. "I used to work as an attorney," he said. Sirisakorn came to the final day with a decent stack, sitting in third place among the 14 remaining players. He ran over his table right from the first level, climbing over the one-million-chip mark during the first hour of play. Sirisakorn took care of Mikhail Semin in 11th place, and Nayoa Kihara busted in the following minutes to let the last nine players merge onto the final table. Sirisakorn was second, within a striking distance of Larry Tull. Start-of-day chip leader Alex Luneau was soon dispatched in ninth place. Next to leave was the last female player standing, Bonnie Rossi. She was eliminated in a massive hand that saw her all in on the flop while Jared Bleznick and Sirisakorn tangled for the side pot, ending up on a three-bet river. Bleznick showed a straight flush, beating Sirisakorn's ace-high flush. While Bleznick was nearing two million in chips, Sirisakorn dropped to 330,000, and he'd certainly lost three-quarters of that. But the momentum shifted Sirisakorn's way when he doubled through John Sorgen and finished him off 10 minutes later. Poker Hall of Famer Barry Greenstein was eliminated in seventh place when he couldn't catch up against Bleznick and Jameson Painter, who chopped his chips. Greenstein left the tournament, earning his tenth and largest cash from the 2017 World Series of Poker. He pocketed $23,595. 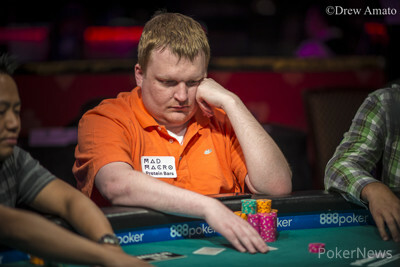 With Sorgen being knocked out in sixth place, the final table remained stuck at five players for more than two hours. Samoeun Mon was bravely handling a short stack, and his opponents couldn't get rid of him. Mon seemed to be bulletproof for a long while, chopping many all-ins through rescue cards on the rivers. After the two-hour stalemate, Lady Fortune finally turned her back on Mon, who lost his remaining two bets to Jameson Painter's queens in an Omaha/8 hand. Larry Tull soon followed Mon to the rail after moving his chips in on fourth street in stud hi-lo hand. Tull held a pair of eights, but he was trailing Bleznick's nines. Bleznick improved to a full house on sixth street, making the river meaningless for Tull, who knew he was going out in fourth place, collecting $62,796. Bleznick, however, was still the shortest stack, coming back from dinner with just under four big bets. He couldn't recover, leaving his short stack to Sirisakorn in an Omaha/8 hand. Bleznick added another near-miss to his résumé, finishing within the top ten for the sixth time in his career. This time, his efforts were enough for a $90,640 third-place prize. Jameson Painter, another star who has been constantly knocking on the golden door, entered the heads-up battle with a three-to-two lead. The chip distribution quickly changed the other way, with Sirisakorn showing some straightforward aggression. "I wanted to remain aggressive throughout the match. But if you saw my cards, I was running good," Sirisakorn admitted. "Caught some good flops, good turns, good rivers... and it worked out." Sirisakorn was betting nearly every street in omaha and stud, and his strategy paid off. He was picking up great hands, and Painter couldn't find a recipe for how to fight back as Sirisakorn stormed through the heads-up match. Painter managed to get some of his chips back, but his rally came close to an end when he called off another triple barrel in an Omaha/8 hand, only to see Sirisakorn nutted two ways with ace-deuce of spades. Painter then doubled twice in a row, but he needed much more as Sirisakorn still held a commanding lead. He didn't let the chance slip through his hands, ending the tournament at around 11:30 p.m. PDT. "Better lucky than good, I guess," Sirisakorn smiled, adding that he wasn't stressed by the star-studded lineup he had to face at the final table. "I'm mostly a recreational player, so it might be even better not to know [about the opponents]," he said. Jameson Painter limped, and Smith Sirisakorn checked his options. They saw the land on the flop, and Sirisakorn led into the pot with a bet. Painter called. Sirisakorn checked on the turn, and Painter took the betting lead. Sirisakorn checked his cards and called. The river was the , and Sirisakorn bet for Painter's last 40,000 effective. Painter called. "I've got a straight," Sirisakorn said, rolling over . "That's gonna do it," Painter replied, showing his for trips. Jameson Painter raised to 160,000 on the button, and Smith Sirisakorn called in the big blind. The flop landed . Painter committed his final 60,000, and Sirisakorn called. The turn and river landed the and the , and Painter doubled again. From the button, Smith Sirisakorn raised to 160,000, and Jameson Painter called all in for 110,000 total. The board ran out , and Painter doubled through to 220,000. Jameson Painter limp-called to see the flop. 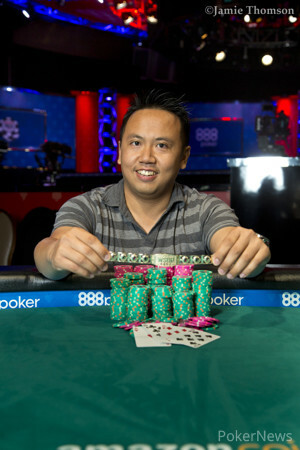 Smith Sirisakorn, just like nearly always, continued pushing bet after bet toward the middle. Painter called on the flop and called again on the turn. Sirisakorn fired one more time on the river, and Painter called again, only to see in Sirisakorn's hand for both the nut flush and nut low. Painter was left with 110,000. Smith Sirisakorn raised his button, and Jameson Painter called. The flop landed , and Painter check-called 80,000. The turn landed the . Painter checked, Sirisakorn bet 160,000, and Painter folded and dropped to 750,000 in chips. Smith Sirisakorn is usually the player who pulls out bets, and the following hand followed that pattern. Sirisakorn raised with a king, and led out on fourth and sixth streets as well. Painter paired his seven on sixth, but opted for a check-call. The river was checked by both players. Sirisakorn had kings full and Painter didn't peel two low hole cards, ending up scooped. Smith Sirisakorn completed, and Jameson Painter raised to 160,000. Sirisakorn called, then called bets on fourth, fifth, and sixth streets. Both players checked seventh, and Painter tabled his . Sirisakorn mucked. Jameson Painter raised the button, and Smith Sirisakorn three-bet the big blind. Painter called, then called bets on every subsequent street as the board ran out . Sirisakorn tabled his for the low, and Painter revealed his for the high.